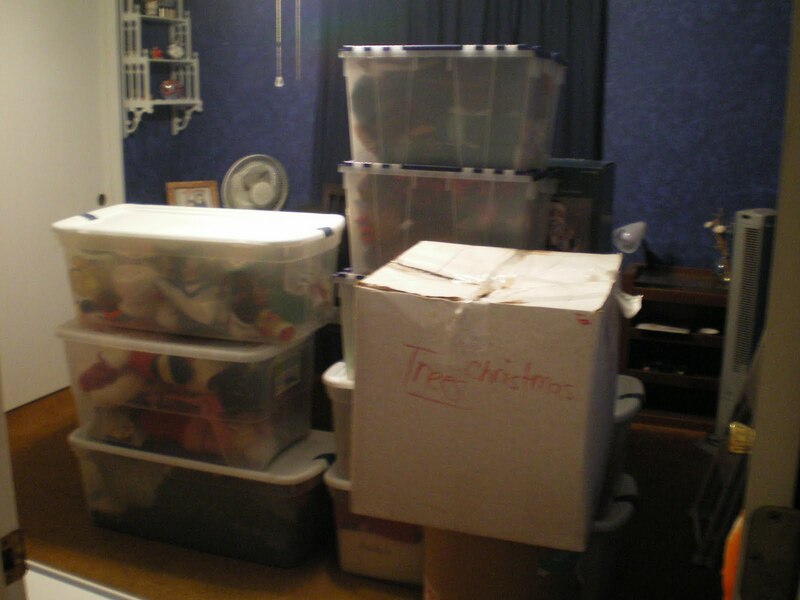 Well as you can see the decorations are still in containers/boxes (12 to be exact)however they are one step closer and my 4-1/2 year old granddaughter will be coming over this afternoon after preschool to help YaYa deck the halls-walls-tables-shelves-tree . . . no doubt there will not be a bare spot in the house (now I am glad it is a small home) . . . In getting ready to begin the decorating at home I decided to begin putting up the decorations at work . . . still need to get the greenery and candy/cookies put out . . . but its getting there . . . Thanks for stopping by to visit . . . until later . . HUGS & KISSES! Well . 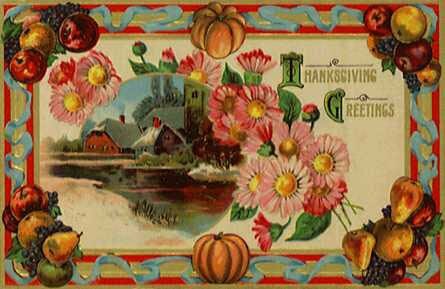 . . it’s the second day in December and I still have not decorated the house or tree yet – hubby has promised that he will bring in all the boxes today . . . I did however want to share with you a picture (from last year’s tree) of the very first handmade ornament that I ever made . . . it’s unbelivable that this Santa is 41years old this year . . .
my husband was still in college when we got married in 1969 and as typical college students we could not afford anything . 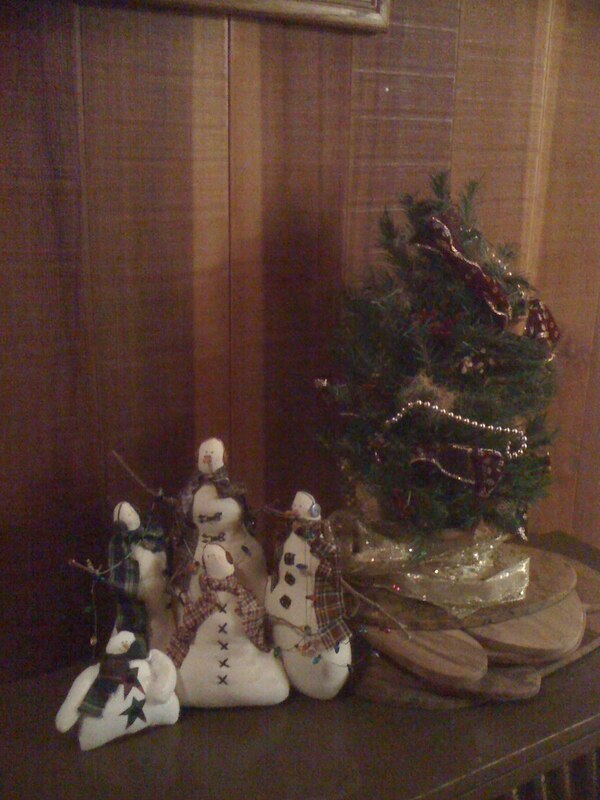 . . we had purchased a Christmas tree (thanks to a Christmas check from my grandmother) but we did not have one thing to put on it . . . no lights, no ornaments, no tinsel – nothing . . . I remember how that poor tree looked so sad standing naked in our living room . . .
a few days after we purchased the “tree” my mother-in-law’s care package arrived (she worried about us starving & freezing – sooooooo every month she would send us a box with strange food/clothing/books & magazines in it – anything that she thought we poor college students would need – I remember she sent us a box of “hamburger helper” when it first came out and had us rate it – it was terrible! – glad to hear they have improved the product over time) . 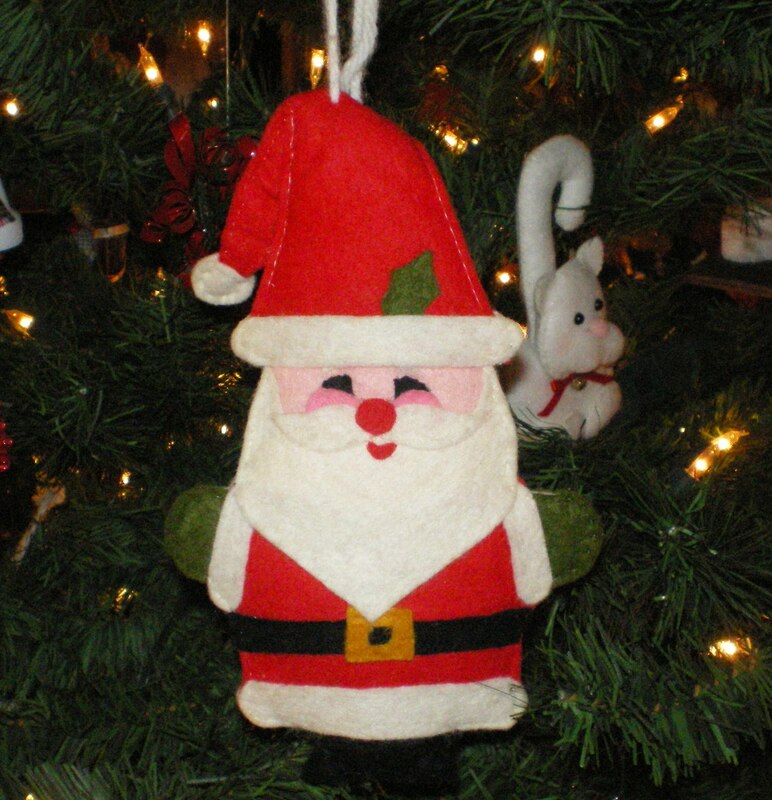 . .
anyway back to the Santa ornament . 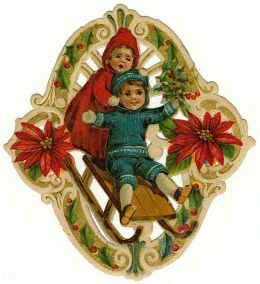 . . in this particular box was a McCall’s Christmas craft magazine and it had the cutest Santa and Snowman hand puppets and all you needed was felt, glue & some hand sewing – hey I could do that – I could afford those items . . . soooooooo off I went to the local Ben Franklin’s (the town we lived in did not have a fabric store) . 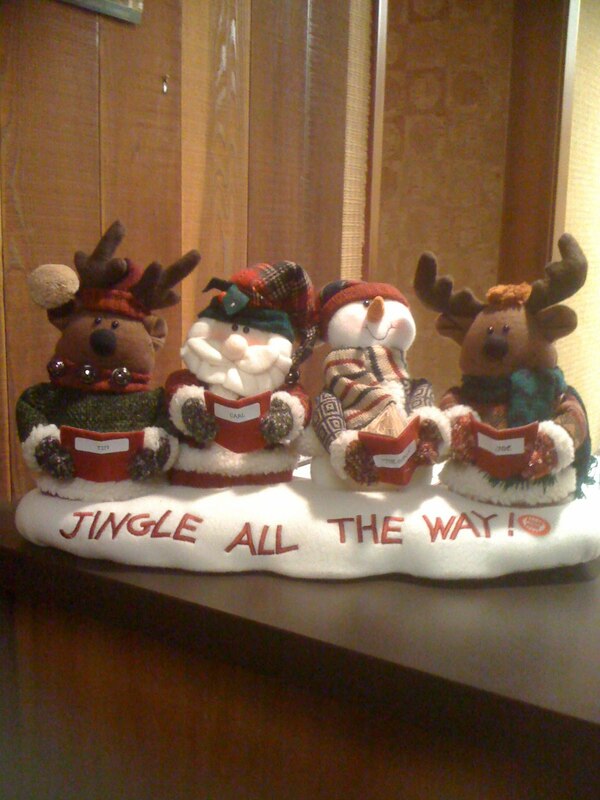 . . now I know I said that this Santa was suppose to be a hand puppet but as I am not very good at math I did not enlarge the pattern and so I ended up with cute 5″ Santas and Snowmen (stuffed with cotton balls) . . .
over the years most of the Santa’s and all of the Snowmen have gone to Santa/Snowman heaven (felt & glue just were not made to stand the test of time apparently) so all I have left now is this little jolly fellow . . . he is falling apart but he will always have a place of honor in the very front of our Christmas tree every year and he brings back such wonderful memories of Christmas’s past . . .
WOW . . . I cannot believe that we are already in the month of December . . . it seems that the older I get the faster time goes by and the slower I move . . . I mean I do not have one, not one, Christmas decoration out yet . . . usually by this date I have started decorating the house, I have baked at least two different types of cookies, the tree is up and we are beginning to trim it (this takes a whole month), and I am beginning to wrap presents (you know all those special gifts that you purchased/made during the past year and that are hidden throughout the house). . . welllllllll I have done NOTHING, NADA! . . . I am going to have to have my dear hubby start bringing in the decoration boxes tonight as I have a little girl (my precious granddaughter) wanting to help me decorate (this has become a yearly tradition with her & I). . . I should have taken this week off from work!!!!! Oh . . . and throw into the mix that I am hosting a sit down potluck dinner party for 16 people in my tiny tiny tiny home (945 sq. ft)Sunday, December 12th!!!!!!!! Well I had better get started and in the meantime you should check out a couple of blogs for inspiration . . . these talented ladies are Christie Bryant (she is on the Graphic 45 design team) and Irene Tan (she is on the Tim Holtz design team) . . .
Soooooo HI HO – HI HO it’s off the decorating I go!!!!!! . . . thanks for stopping by . . .
Do you ever have a beloved photo that you are waiting for just the right paper/layout to inspire you . . . well I was and it took three years but boy when I saw a layout created by Irene Tan (aka Scapperlicious) for “The Crop Spot” I knew that what she had created would be perfect for a photo I had of my beloved “boys” (my dear husband and son) . 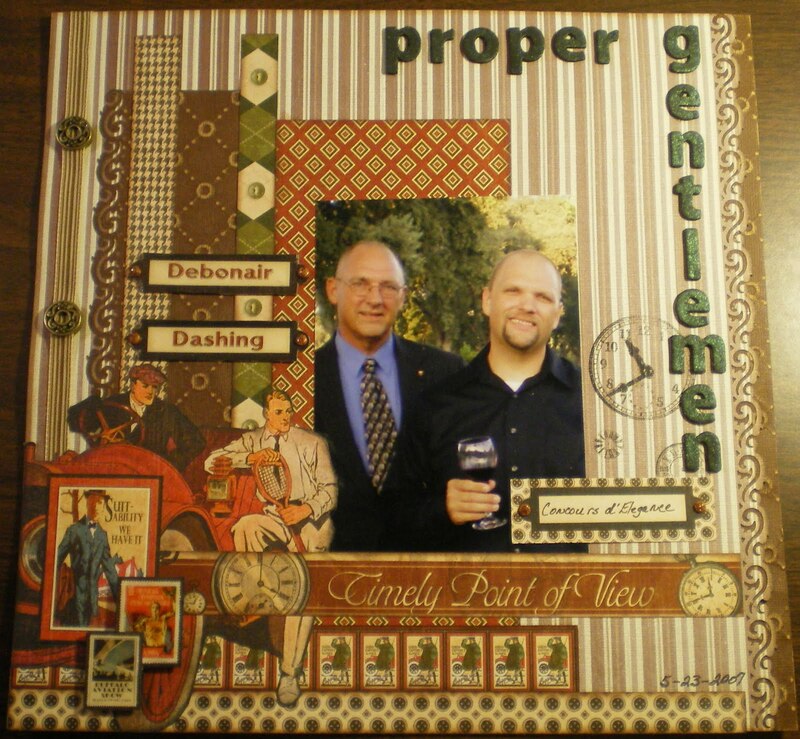 . . even the name of the paper collection was perfect – Irene had used Graphic 45’s “A Proper Gentleman” collection! As you can see by the picture below the wait was well worth it . . .
What made this particular Graphic 45 paper collection perfect is that my “boys” love to go to car shows and I was able to procure tickets for Chico’s 2007 Concours d’Elegance (where vintage cars are on view) . . . we attended Saturday night’s preview show and dinner/dance . . .
Well that’s all for tonight . . . thanks for stopping by . . . 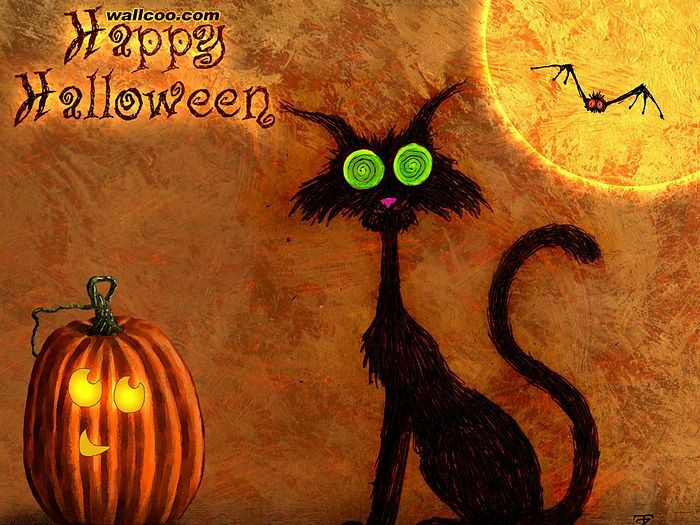 I will be posting some Holloween creations that I have done over the past week soon . . . HUGS & KISSES! My husband, like all husbands, has a hobby . . . I like to call it a “gift” . . . he just thinks his hobby is out of necessity. He does not play any sports on a regular basis (even though through the years he has participated in various sports such as softball, tennis,volleyball, golf) – nor does he hunt or fish. Now I know you are asking what does he do beside watch the San Jose Sharks hockey team? What is his hobby? Well, he loves to work with WOOD!!! He is right in thinking that his hobby originally started out of necessity – like all newlyweds we needed bookcases (he was still in college when we married) but he had no tools and we had no money. He was not raised around anyone who worked around wood or even did home repairs (his parents always had a handyman/gardener). He never took woodworking shop in school, but oh what a natural gift he has. We still have one of the two bookcases he made (our daughter has the other one). I could list all the many items he has made over the years, not only for his home and family but for our church, our friends, even strangers in need . . . he loves to work with wood and I have to admit that I take advantage of his talent . . . 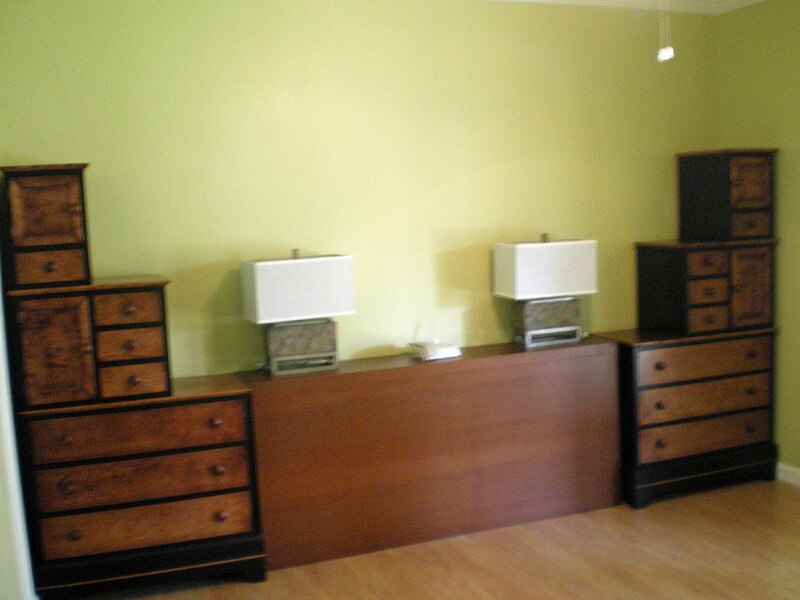 Above is a picture of the mirror image “chest of drawers” he made for our remodeled master bedroom. What is truly amazing is that he only had a picture of one set of drawers that I had torn out of a magazine about ten years ago. I had forgotten that I wanted him to make me two of these sets drawers instead of one, but he did not. I truly thought it would be too complicated for him. Oh yea of little faith . . . he did it!!!!!! And they are very beautiful (my picture does not do them justice). They fit the space perfect . . . but guess what – he didn’t stop there. He went on the build the below pictured seating bench for the end of our bed. Now this is no ordinary seating bench to throw the pillows & bedspread on, oh no it has a secret, it is actually a dirty clothes hamper. 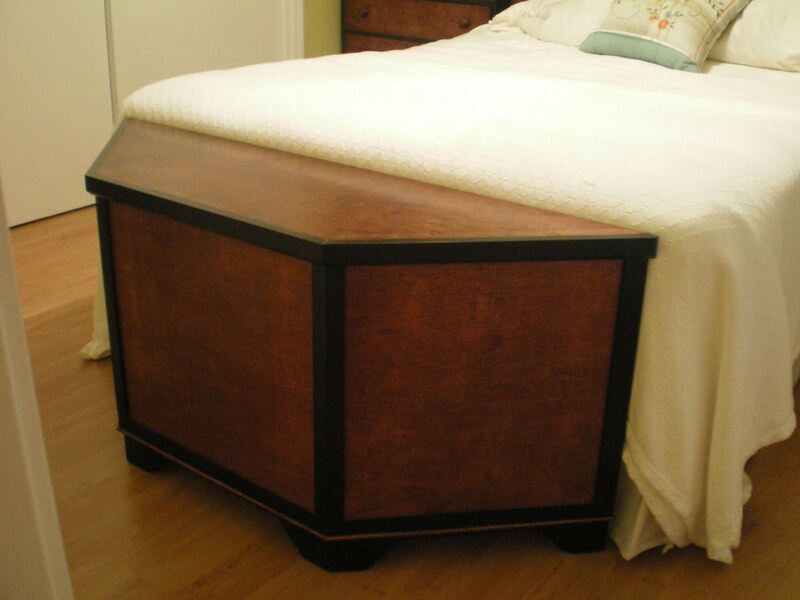 Is that not cleaver and look he made it match the design he created for the “chest of drawers. Like I said at the beginning, my husband has a true gift . . . he has already begun drawing up the plans for his next little project and I will share it when it is completed. That’s all for now . . . thanks for stopping by and getting to know a little more about my dear hubby and one of his many exceptional talents . . . till later, HUGS & KISSES . . .
P.S. . . Oh one other thing, he now has lots and lots of tools, so many in fact that we cannot get the car in the garage and every time he starts a new project-he needs a new tool (kind of reminds me of me and when I scrapbook-hehehe) . . .